Make the Lemon Mayonnaise In a small bowl, whisk the mayonnaise with the scallions and lemon zest and juice. Season with salt and pepper. Transfer 1/2 cup to a small bowl and reserve the remaining mayonnaise for serving. Make the Chipotle Salmon Cakes In a medium bowl, mix the 1/2 cup of reserved lemon mayonnaise with the scallions, chipotle and 1/2 cup of the breadcrumbs. Gently fold in the salmon and season with salt and pepper. Line a large rimmed baking sheet with parchment. Form the salmon mixture into eight 2-inch patties and transfer to prepared baking sheet. Refrigerate until firm, about 30 minutes. Meanwhile, in a shallow bowl, beat the eggs with a pinch of salt. Spread the flour and panko into 2 separate shallow bowls. Dredge the patties in the flour, gently shaking off any excess. Dip the patties in the eggs and then dredge in the panko, pressing lightly to help it adhere. In a large skillet, heat 1/4-inch of canola oil until shimmering. 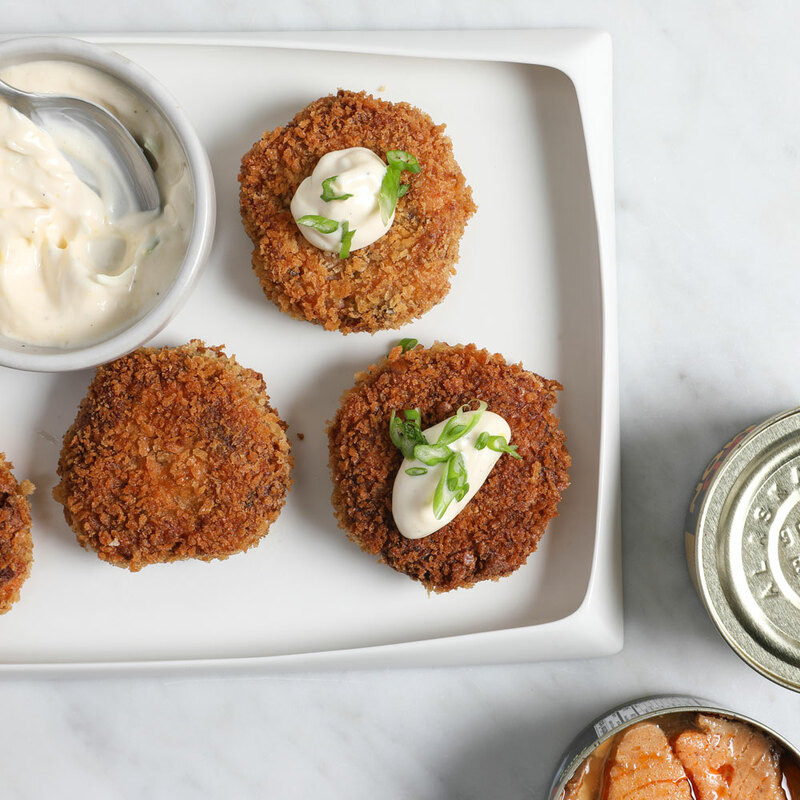 In batches, fry the salmon cakes in a single layer over moderately high heat, turning once, until golden and hot, about 6 minutes total. Transfer to paper towels to drain. Arrange the salmon patties on a platter, garnish with thinly sliced scallions and serve with the lemon mayonnaise.